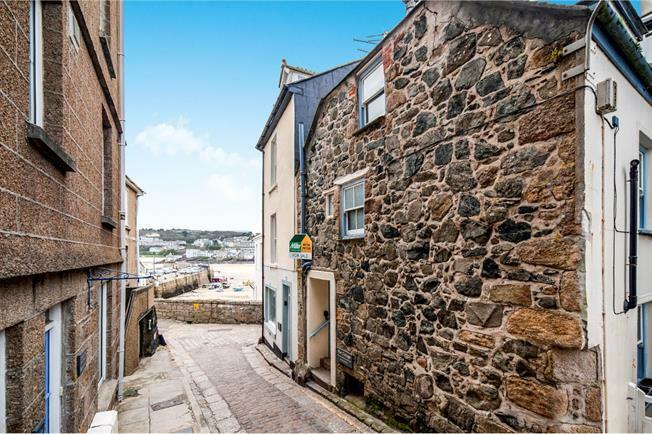 2 Bedroom Terraced Cottage For Sale in St. Ives for £425,000. Pier Cottage is a stunning character cottage set over four floors which offers cosy and charming accommodation which comprises in brief of; A living room with exposed floorboard and feature fire place, a cottage style kitchen with exposed granite walls and great dining space, a double bedroom and family bathroom on the first floor and a dramatic master bedroom on the second floor with vaulted ceilings and exposed beams. This cottage is currently an extremely successful holiday let, furniture is therefore negotiable and figures for last years bookings are available by request. A wooden partly glazed stable door leads into the cosy living room with original floorboards, exposed beams and granite walls, a feature fire place, a radiator and two wooden sash windows to the side both with window seats. From the living room stairs lead down to the kitchen and up to the first floor. A real cottage style kitchen diner with tiled flooring, exposed beams and granite walls and two wooden windows to the front. There is also a large and useful under stairs storage cupboard. The kitchen comprises of; white high gloss wall and base kitchen units with a wooden work surface, a tiled splash back, a Belfast style sink, a five ring gas hob with overhead extractor and single oven. There is space for a washing machine, dishwasher and fridge freezer. A carpeted staircase leads to the first floor landing which has access into the second bedroom the family bathroom and also the staircase to the top floor. A double bedroom with carpeted flooring, exposed beams and granite, a radiator and two wooden sash windows to the side both with window seats. A family bathroom with tiled flooring, a panel bath with shower over with glass screen, a push button flush toilet, a vanity unit with wash hand basin, a heated towel rail, exposed beams and two frosted wooden windows to the front. The walls are particularly panelled with tongue and groove panelling.